The Wake Atoll Commemorative DXpedition has finally been approved for entry to Wake after a month-long delay. This amateur radio operators’ mission commemorates the 98 American civilian contractors who were killed on Wake in October 1943 and is dedicated to preserving their memory. The twelve-man team, now scheduled to arrive on Wake November 2 (across the International Date Line), will set up antennas and stations and commence long-distance ham radio operations for the duration of their two-week stay. Despite the government shutdown and delays in approval, the Wake 2013 DXpedition is taking place thanks to the persistence, commitment, and dedication of the group and especially team leader Lou Dietrich. By honoring the “Forgotten 98,” the team brings attention to these men at an important time. The Joint POW-MIA Accounting Command (JPAC) is actively seeking family members to provide DNA samples for these men in order to identify some recently discovered remains on Wake. I have been helping JPAC locate the families since the fall of 2011 and in two years we have been able to obtain Family Reference Samples for just 34 of the 98. With the global reach of the Wake DXpedition, their dedication to the 98, and inclusion of the JPAC mission in their PR, we have an excellent opportunity to reach more families for this important work. If you are or know any family members of these men (full lists available here or at the Wake Atoll Commemorative Expedition website), please contact me. For more information on the Wake 98 and the JPAC mission, please review my past blog posts on the topic by linking to the titles listed below. 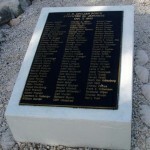 Thanks to the Wake Atoll DXpedition for honoring our men. Godspeed and good luck to you!